With football season upon us, it’s time to think about getting people round to watch the game and watching the game means an abundance of snacks. Snacks don’t have to be unhealthy and I am going to show you how to make a traditionally unhealthy snack that little bit lighter. Snacking gets a bad rap, but they don’t have to. If used the right way, then snacks can be a healthy way to keep your system ticking over until your next meal, or they can be the thing that you enjoy with friends at a social gathering. **Firstly – I AM GOING TO AMERICA TOMORROW!!!!! Tomorrow I fly to New York to start my 6 week trip and I am SO excited. Make sure you are following me on Facebook and Instagram to see all my updates. For me, during my weight loss, snacks were so important. I was used to eating such a large amount, that cutting that right down was always going to be a struggle, so I filled the gaps between my meals with healthy snacks like fruit, nuts and healthy protein* like Quorn snacks. Snacks should be packed full of healthy protein*, to help you stay full until your next meal and Quorn Meat Free Cocktail Sausages and Quorn Meat Free Savoury Picnic Eggs are a fantastic source of healthy protein*. Don’t just see it as an ingredient to add to your meals, they have a great snack range too. It’s not just snacking between meals though. As I say, snacks are an important part of social occasions and if you are trying to improve your diet, then that can fill you with fear when you know you are going to be faced with all kinds of tempting treats. Whilst there is nothing wrong with indulging (I encourage it), it’s always good to have a healthy option on hand so you know you can fill up on that. When we go to a party, I always offer to take a dip and things to dip in it. Not only is it polite to offer, but if everything else is deep fried or dripping in cheese, I know I have what I brought. 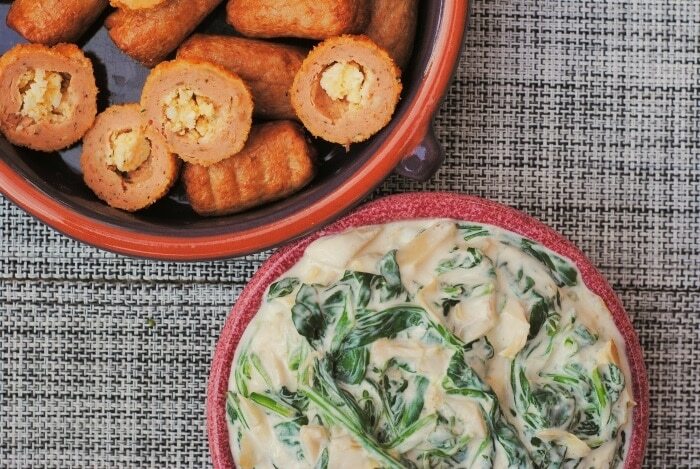 No matter what the dip, I always take some carrot and cucumber sticks and some Quorn snacks like the Quorn Meat Free Cocktail Sausages or Quorn Meat Free Savoury Picnic Eggs. You know what? Meat eaters have never known that they were meat free, which I think is testament to just how good Quorn is. Hot dip is where it is at and if you haven’t tried a hot dip before, then make it your aim this week to try it. 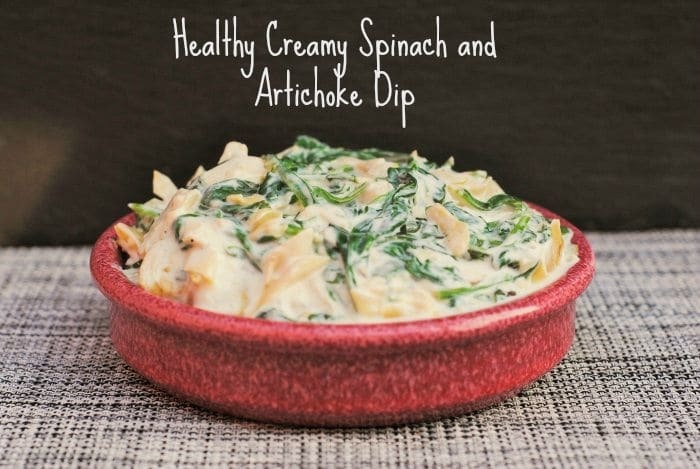 Creamy spinach and artichoke dip is traditionally packed full of full fat cream cheese, sour cream and more cheese, but my version has all of the creaminess, but with much less fat. I have used reduced fat cream cheese and fat free Greek yoghurt so there is all the flavour still, but lower in calories. What’s not to love about that! The Quorn Meat Free Savoury Picnic Eggs are the perfect addition to this dip as they act like little cups to scoops the dip in to. People will be fighting over this on game day! 1) In a large pan, add a couple of sprays of spray oil and add the spinach and cook until wilted – around 3 minutes. 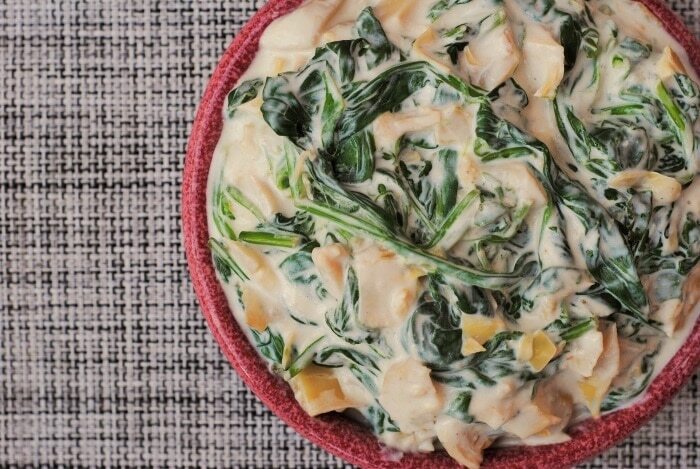 2) Add the cream cheese and stir until melted and stir in the rest of the ingredients. 3) Serve with Quorn Meat Free Cocktail Sausages, Quorn Meat Free Savoury Picnic Eggs and some cucumber and carrot sticks. 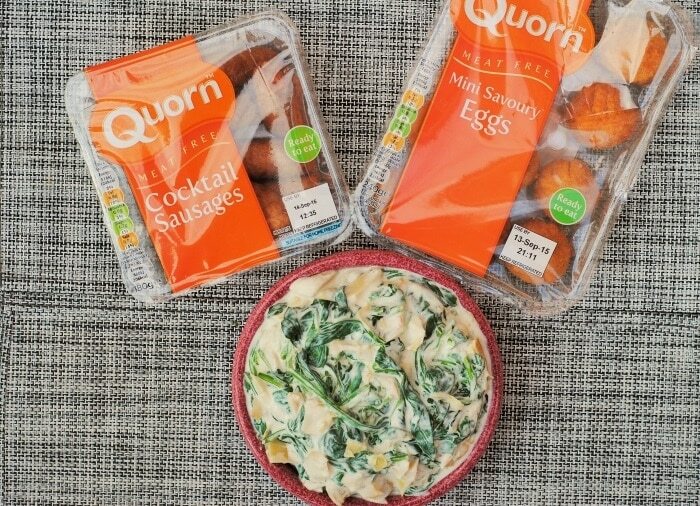 *Quorn Meat Free Cocktail Sausages and Quorn Meat Free Savoury Picnic Eggs are a nutritionally healthy protein source. Protein contributes to the growth in and maintenance of muscle mass. This recipe is sponsored by Quorn. Thanks for sharing this recipe. Really delicious.